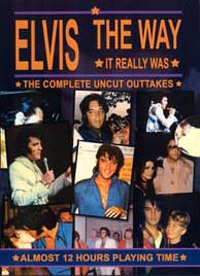 According to FECC the new 2 DVD set with the title "Elvis The Way It Really Was - The Complete Uncut Outtakes" is out. This DVD is loaded with TTWII outtakes, and as a bonus it included the 8MM footage of Birmingham, Al. December 29th & Chicago, IL October 14, 1976 overdubbed with a soundboard audio. Also it features 2 audience bonuses of the Jan 29th, 1971 Las Vegas and August 11th 1970 shows. The quality is almost similair what has been released so far on DVD, but here we have a truckload full. Overall you will get a lot of stuff of almost 12 hours for a fair price. Some DVD's are double-sided, which means it's possible to include 4 times 3 hours of material. Don't know if these are, though. Impossible! There is so much material on TTWII there is NO way this is the complete 'uncut' outakes. 12 hrs isnt going to produce a quality picture on a couple of DVD's anyway, so i'd stay away from it. No site or person will or can give details about where one can buy this release simply because it is not for sale in regular retail shops. It pays to look around, ask Elvis fans that know you, ask your regular retailer, et cetera. A lot of times people that know I am an Elvis fan tell me they have this or that for sale. So anybody know where one can purchase "DVD Elvis The Way It Really Was - The Complete Uncut Outtakes" A member of my Elvis group is inquiring about this. This was announced on FCCC website (For CD Collectors Only Website). They should really give more details on how one can purchase this. Thanks if you can email me of where this can be purchased would be appreciated. Thank you. Looking at the cover, Elvis looks so young! It makes me feel so old. But I will definately buy it, if I know where to fnd it. Which region is this DVD? This material has been on the bootleg market for almost a year, in vastly varying quality. This release has twelve hours of material on two discs, which must surely give poor picture quality. The cover is great, but the most important thing is the quality of the material. Hopefully I'm wrong and this release is in good quality, but I doubt it. TTWII outtakes, Chicago, and Birmingham were available online from a bit torrent site for download. It's funny someone packaged them and is now selling them! Where can i order it from? I will buy it for sure. wow good stuff... Where can we get it ????? ?